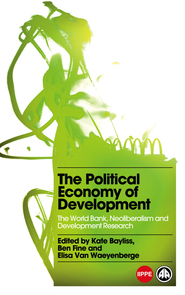 The Political Economy of Development is an invaluable critical resource for students, policy-makers and activists in development studies.Despite the diversity of topics, some common themes have emerged. First, the chapters each point to weaknesses in the neo-liberal framework used universally across diverse topics. Methodological individualism is stretched beyond the limits of credibility. Second, a narrow economics dominates over all other disciplines in World Bank research. Third, the chapters in this book show time and again that Bank research relies on large empirical studies using sophisticated statistical methods which give the illusion of science and certainty when the underlying data and theory are often not robust. Finally, the chapters show that, across subject areas, the Bank is wedded to pro-market (i.e. private capital) policies. The book is by no means exhaustive and many more topics need to be covered, particularly climate change and poverty reduction. However – in light of the increasing propensity to crises as recently witnessed in finance and agriculture – the authors present a timely alternative perspective on development research on which others can draw and to which they can critically and constructively contribute. Kate Bayliss has been working on public sector reform for over a decade with particular focus on privatisation of water and electricity. She has worked as a consultant for international agencies and NGOs. Ben Fine is Professor of Economics at the School of Oriental and African Studies, University of London. He is the author ofTheories of Social Capital (Pluto, 2010) and co-authored the award-winning books From Economics Imperialism to Freakonomics (2009) and From Political Economy to Economics(2008). Elisa Van Waeyenberge has worked on the World Bank for over a decade. She lectures at SOAS and consults for international organisations. 1 Reply to "The Political Economy of Development: The World Bank, Neoliberalism and Development Research"
Firstly congratulations. Your efforts are worth for us. Esconde, Where can I find the Books?